I don’t typically host Instameets but I thought to do one for Worldwide Instagmeet, #WWIM11, in El Dorado Hills instead of going to Sacramento. Note that there are thousands of Instagrammers doing the worldwide instameet during the weekend of March 21 and 22. We are doing ours on March 21 (Saturday) so we have time to post (and process) our photos. Though the event is located in El Dorado Hills, this is not exclusive to El Dorado Hills Instagrammers. If you love photography, this is the place for you! Who: Instagrammers of El Dorado Hills, Folsom and nearby are welcome to join us! What: 11th Worldwide Instameet in El Dorado Hills. Theme: Find shapes, lines and patterns in the Town Center. 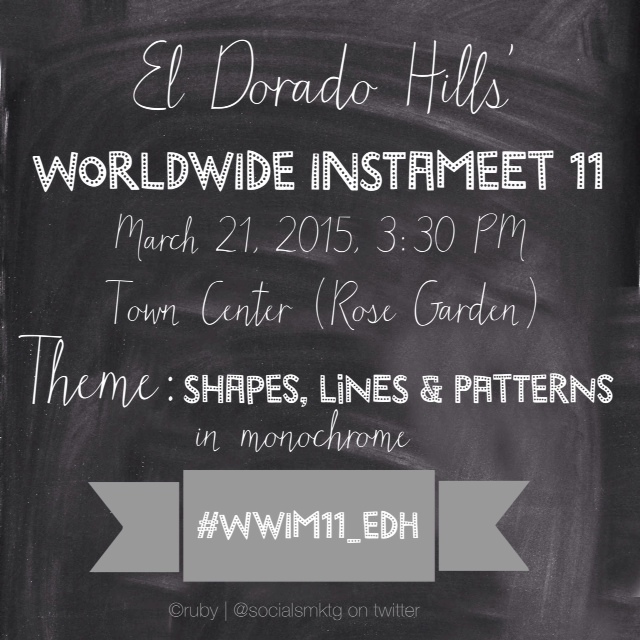 Use hashtag #WWIM11_EDH to tag it to the El Dorado Hills event and so Instagram sees your post. This event is registered with Instagram so they know we are doing one, unless I cancel it. If you have question, please feel free to contact on Instagram: Melissa (@wildearthspirit) & Ruby [me] (@SocialSMktg) . We both host this event. This event is one way too to meet other fellow Instagrammers IRL (in real life). You may also email me at ask[at]socialsuccessmarketing.com if you need more info about this event.